A lot of people think that cleaning is all about keeping your home looking nice. But it’s actually about much more than just maintaining your home’s aesthetic appeal! Cleaning things in your home actually keeps you safe and healthy! From simple things like preventing allergies, to more critical protection like preventing fires or E. coli, keeping your home clean is really important! If you’re forgetting to clean certain things, you may be putting yourself in a potentially dangerous situation (to be a bit dramatic)! 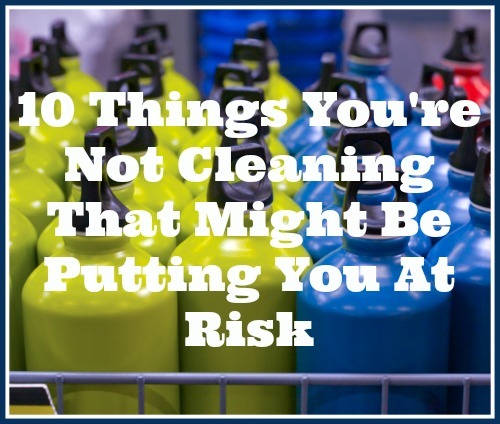 Here are 10 Things You’re Not Cleaning That Might Be Putting You at Risk! Definitely put these on your cleaning schedule! Water bottles are one of those things that for some reason many people forget require cleaning. After all, all they contain is water, right? Well, anyone who’s had a humidifier or pet fountain can tell you, water holding things get dirty, too. It doesn’t take long for a red colored deposit to show up in the corners of continually wet things. Left alone even longer, you’ll see algae start to grow! So if you keep re-filling your water bottles without cleaning them out every now and then, expect to see something growing! We use a bottle brush to clean ours. There are also cleansing tablets that you can buy to clean your bottles. Here are some tips for cleaning your water bottles. Yet another of the many things you’re not cleaning is likely your pillow forms! Pillows get dirty easily, from oils from your face, hair product, sweat, and even drool. If left unwashed, they can become wonderful hosts for dust mites and fungi, which are especially bothersome to allergy sufferers! So don’t just clean your pillow covers, clean your pillow forms too! Here’s post that shows you how to clean your pillows in the washing machine. Few people remember to clean their laundry hamper! Yet we all dump dozens of dirty, sweaty, oily clothes into our hampers every week. All of that dirt and oil doesn’t just stay on your clothes! Some of it rubs off on the basket itself, creating a potential bacteria carrier. Bath mats are another common household item that doesn’t get cleaned often, but really should. After all, think of how much time your bath mat spends being wet, surrounded by steam, and trapping condensation underneath itself. That’s a recipe for bacteria, and maybe even mold! So make sure to wash your bath mat weekly in your washing machine (most bath mats have care labels so be sure to check your’s before washing). Have you ever thought about how dirty your TV, stereo, and DVR remotes are? People touch the remotes all the time, leaving behind oils from their hands, maybe food grease and crumbs, and more. It’s even worse if someone has been sick in front of the TV, clutching a remote the whole time! So make sure to disinfect your remotes ever week or so, to kill the many bacteria that are living on them! Here’s a good article on how to clean your remote control. If you never clean your kitchen sponges then you’re creating a nice wet place for bacteria to flourish. And then you’re using those sponges to “clean” your dishes and counters? All you’re doing is spreading bacteria, possibly including especially dangerous bacteria like Salmonella! So make sure to clean your sponges every few days, especially after wiping down a counter after working with raw meat. We put our kitchen sponges in our dishwasher (with a regular load of dishes) to disinfect them. We also use the microwave to disinfect them (1-2 minutes on high with the sponge wet). Be sure to toss your kitchen sponges after a few weeks (depending on use). Some other things you’re not cleaning (but should be) are the handles and buttons of things in your kitchen. This includes the hardware on your cabinets, the handles to open your fridge, the buttons on your stove, and more! These easily become breeding grounds for bacteria because not only do people touch them all the time, but they often touch them with hands that were just touching uncooked food (even raw vegetables can have bacteria on them)! So to prevent any food-borne illnesses, clean the handles and buttons in your kitchen. 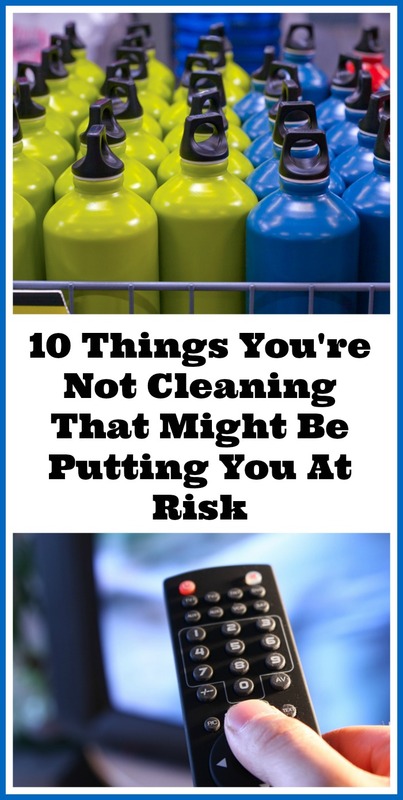 Some of the more surprising things you’re not cleaning that are putting you at risk are your smart gadgets, namely your smartphone and tablet. Just because they have hard surfaces doesn’t mean they’re impervious to germs! On top of that, many people use their smart gadgets while on the toilet, or directly after when they haven’t yet washed their hands. That means your phone and/or tablet could be really dirty (despite looking clean). To keep them from spreading anything gross, make sure to disinfect them every week. Keeping a home clean without some sort of schedule is kind of impossible. That’s why you need a Cleaning Binder! It’s full of handy cleaning schedules to make it easy to keep your home neat! 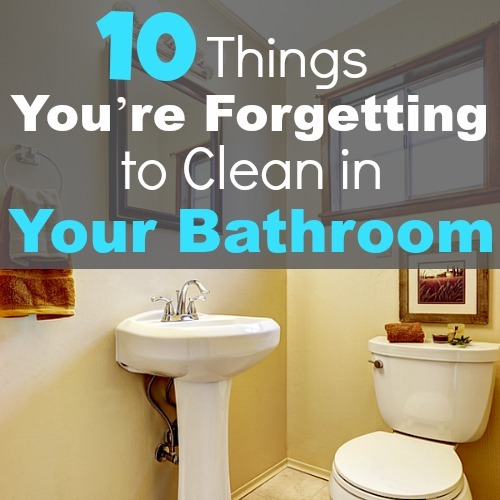 Do you already clean some of these things? Thanks so much for this post. I’ve been nagging the husband to clean the dryer vent and he keeps saying he did already (yeah, 3 years ago!) I followed your link to Amazon and will be ordering several tools to help with the cleaning of the vent and the dryer lint area inside the dryer. I was especially excited about the connection to my vacumm hose that I found at the site your link took me to. So thanks again! I feel safer already knowing it’s on its way. That’s great! Thank you so much for using our link to Amazon. Let me know which tool you think works the best! I always assumed that my bath mat would be almost “self-cleaning” as it is regularly in hot soapy water. I just lifted it up and was almost embarrassed by the mold underneath! It went straight in the bin and I have ordered a new one. Thanks for the tip!